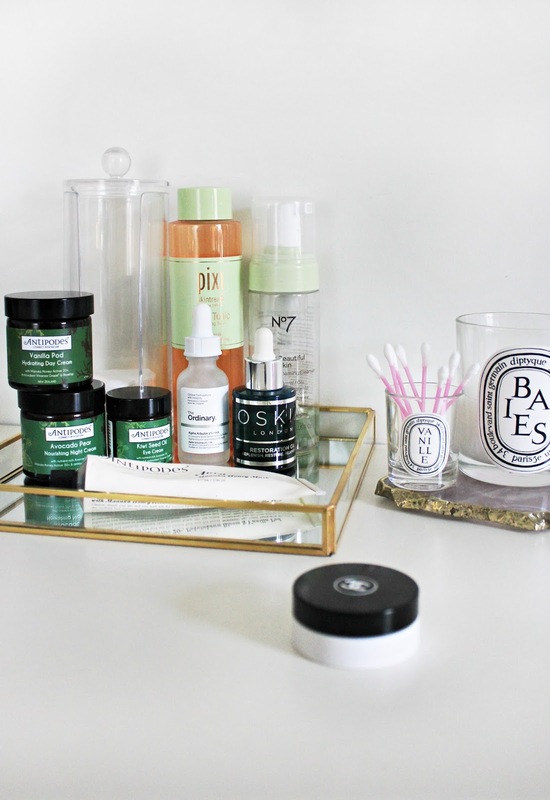 It’s been a long while since I shared my skincare routine up on this blog, and seeing as I spent most of April revamping the selection of products I’m using, I thought this would be a good time to create a post. Being on Accutane, my skin has gradually changed and become more dry and flaky than usual. This meant that I had to find new products which helped combat these issues and worked well at keeping my complexion smooth – especially under makeup (believe me, it’s the worst thing when you have bits of foundation flaking off your forehead and onto the desk during meetings!). 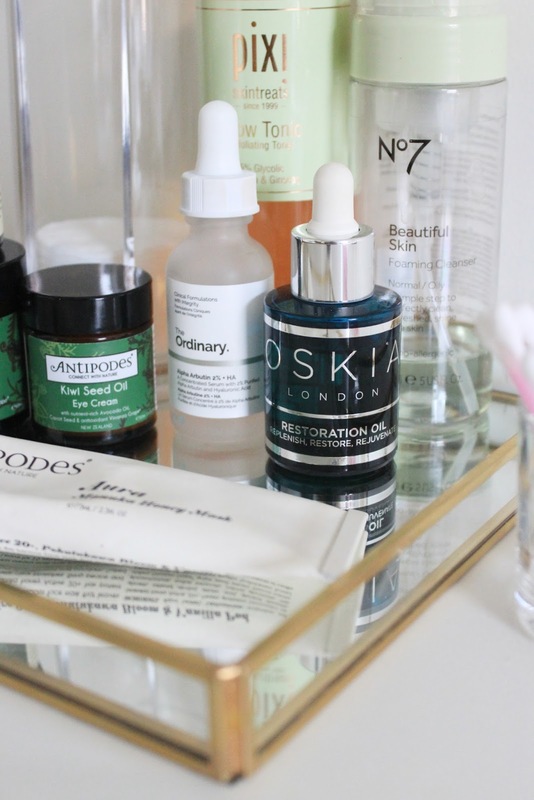 My skincare routine is different depending on the time of day – in the morning, it’s much simpler, whereas at nighttime, I try to choose products that will give me the most hydration during sleep. When I wake up, I usually cleanse my face with a pump of the No. 7 Beautiful Skin Foaming Cleanser as it’s light and leaves my skin feeling clean without being stripped of all natural oils. I follow this up with an application of the Antipodes Vanilla Pod Hydrating Day Cream and the Antipodes Kiwi Seed Oil Eye Cream. Both of these moisturizers act as the perfect base underneath makeup and provide enough hydration to keep flakes at bay. That’s usually it for the morning, and I go ahead and apply a primer and the makeup that I want to wear that day. At night, I cleanse my face using the same No. 7 cleanser, apply the Pixi Glow Tonic using a cotton round, and then follow up with the Oskia Restoration Oil. This is great for renewing skin and giving it an extra boost of hydration, and it doesn’t feel greasy or sticky as you might expect of an oil. I usually wait a few minutes for this to sink in before applying the Antipodes Avocado Pear Nourishing Night Cream and the Antipodes Kiwi Seed Oil Eye Cream which is the perfect combination for really dehydrated skin. They are very natural products and it definitely feels like a treat to apply them – I’ve spoken more about my love for Antipodes in this post. I also apply a little of my Chanel Hydra Beauty Lip Balm, which I’ve spoken about before. This is an extremely thick consistency so I use it more like a mask so that my lips don’t become too chapped overnight. When my skin asks for a bit more TLC, I usually opt for the Antipodes Aura Manuka Honey Face Mask to heal redness and calm down and flares. I’ve also been loving The Ordinary Alpha Arbutin + Hylaronic Acid to help with my hyper pigmentation on no makeup days. Overall, I’m really happy with the routine that I’ve put together and I feel that the products really work well with each other on my skin. I know that, once I’m off the course of treatment, some of the products I use will change – so if you enjoy reading skincare routines, let me know if you’d want to see an updated one when my skin becomes less dry! What skincare favourites have you been enjoying recently? Next Post Five Ways To Make The Most Of Sunday.